A nasal tip boss (see image below) is an irregular knoblike protuberance of the alar cartilages that creates a visible asymmetry of the nasal tip. In many early articles, bossing is cited as a possible complication of rhinoplasty and trauma. In 1988, Kamer and McQuown demonstrated that bossing was the most common minor deformity requiring revision surgery. Parkes et al conducted a similar study and observed that deformities of the lower one third of the nose were responsible for most revision rhinoplasty procedures. Bossing was the most common cause of the deformations noted in these cases. Nasal tip bossing is most frequently a complication of septorhinoplasty that results in an asymmetrical nasal tip. The main feature of nasal bossing is a prominence of the dome. This complication can occur any time postoperatively but is most frequently encountered within the first 12 months. Many factors may predispose patients to bossing. In the early postoperative period, bossae are secondary to static tip anatomy and are caused by a preexisting irregularity or asymmetry of the dome, as in the case of splayed medial crura. Most commonly, though, bossae develop 1-2 years after surgery. The late-developing bossae are often due to dynamic forces caused by postoperative fibrosis and scar contracture that pull on the weakened cartilages. The predisposing factors include intralobular bifidity, thin skin, and strong alar cartilages. Alternatively, when vertical division may be an indicated maneuver, in the setting of thin skin, Wise et al found that a new modification of intermediate crural overlay prevented bossae formation. In this technique, the lower lateral cartilages are divided at the junction of the medial and intermediate crura, creating 2 pieces that are then overlapped and sutured together. In these 2 circumstances, medial displacement or concavity of the lateral crus may accompany the bossing. The displaced crus further accentuates the boss. 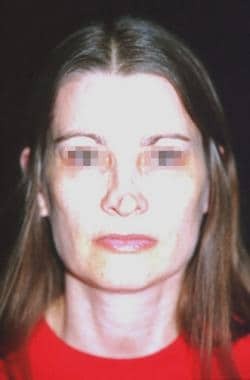 In addition, the use of isotretinoin immediately after a rhinoplasty has been found to be possibly associated with the development of nasal bossae. This association is thought to be secondary to the thinning effect of isotretinoin on the skin, causing bossae to become more noticeable. Bossing may occur after tip surgery in which procedures such as shield grafts and overlay grafts have been performed. Both types of grafts have sharp nontapered edges beneath thin skin. Soft-tissue contraction over time may tilt the grafts and accentuate the problem. Other causes that have weaker associations with tip bossing include young age, first-time rhinoplasty patients, preoperative nasal tip asymmetry, and female gender. Individuals aged 12-22 years and first-time rhinoplasty patients tend to have thicker, firmer, and more resilient alar cartilage. Stronger cartilage seemingly protects against abnormal collapse and buckling; however, several authors point out that this cartilage is actually less malleable and resists conformation. Displacement of a columella strut may occur, or a strut with excessive length may project anterior to the lower lateral cartilage creating a tent-pole boss. Finally, females tend to have thin nasal skin, which does not hide cartilage deformation. Thin skin correction may sometimes be ameliorated by reinforcement with fascial layering or AlloDerm to enhance nasal contour. A classic history includes a septorhinoplasty within the past 1-2 years. The patient is initially pleased with the results; however, an asymmetric nodule forms on the nasal tip without provocation. A patient also may present with bossing of traumatic or congenital etiology. When was the first operation? How many nasal operations have been performed? Were any tip grafts or struts placed? What modifications were made to the lower lateral cartilage? Was any prior trauma experienced? Can the patient obtain previous operative reports and old records? Patients experience knoblike deformities at the nasal tip. Bossing can be bilateral or unilateral and usually becomes more prominent over months to years (see image below). Bossing does not usually alter nasal function; however, it causes asymmetry or an unnatural appearance that is disturbing to the patient. Patients invariably wish to have these nodules removed. An exception occurs with bilateral bossing. This rare complication may sometimes result in a symmetric, often striking, nasal tip that patients may elect not to have corrected. A normal nasal lobule has 2 lower lateral cartilages that start laterally, form a curved dome, and then meet in the midline. If the cartilages do not meet in the midline, a bifid lobular tip results. This condition predisposes the patient to congenital bossing. Septorhinoplasty must be performed with great caution in these patients. Also, exercise caution when modifying the cartilage framework of the nose, particularly the tip. For example, aggressive intradomal suture placement may buckle the dome. Excessive excision or division of the lateral crural cartilage weakens the ipsilateral dome support. As the scar contracts, the dome may collapse upward and laterally, forming a knoblike appearance. Dome support is further jeopardized when a vertical dome division technique is used to enhance projection, rotation, or domal arch width. Correction of nasal bossing is a safe minor procedure. No anatomic contraindications exist for correction, but, like septorhinoplasty, this surgery is an elective procedure. Therefore, patients with cardiovascular disease, respiratory compromise, bleeding dyscrasias, or other physical conditions should not be considered for the procedure. Patients with active herpetic lesions at or near the columella should postpone surgery until the lesions have cleared. Kamer FM, McQuown SA. Revision rhinoplasty. Analysis and treatment. Arch Otolaryngol Head Neck Surg. 1988 Mar. 114(3):257-66. [Medline]. Parkes ML, Waller TS. Practical application of nasal asymmetries in rhinoplasty. Am J Cos Surg. 1988. 5:37-43. Tanna N, Nguyen KT, Ghavami A, et al. Evidence-Based Medicine: Current Practices in Rhinoplasty. Plast Reconstr Surg. 2018 Jan. 141 (1):137e-51e. [Medline]. Loyo M, Wang TD. Revision Rhinoplasty. Clin Plast Surg. 2016 Jan. 43 (1):177-85. [Medline]. Gillman GS, Simons RL, Lee DJ. Nasal tip bossae in rhinoplasty. Etiology, predisposing factors, and management techniques. Arch Facial Plast Surg. 1999 Apr-Jun. 1(2):83-9. [Medline]. Chang CW, Simons RL. Hockey-stick vertical dome division technique for overprojected and broad nasal tips. Arch Facial Plast Surg. 2008 Mar-Apr. 10(2):88-92. [Medline]. Kridel RW, Yoon PJ, Koch RJ. Prevention and correction of nasal tip bossae in rhinoplasty. Arch Facial Plast Surg. 2003 Sep-Oct. 5(5):416-22. [Medline]. Daniel R. Nasal bossae. Arch Facial Plast Surg. 2003 Sep-Oct. 5(5):424-6. [Medline]. Adamson PA. Refinement of the nasal tip. Facial Plast Surg. 1988 Winter. 5(2):115-34. [Medline]. Allen BC, Rhee JS. Complications associated with isotretinoin use after rhinoplasty. Aesthetic Plast Surg. 2005 Mar-Apr. 29(2):102-6. [Medline]. Cohen S. Complications following rhinoplasty. Plast Reconstr Surg. 1956. 18:213-227. Goodwin WJ Jr, Schmidt JF. Iatrogenic nasal tip bossae. Etiology, prevention, and treatment. Arch Otolaryngol Head Neck Surg. 1987 Jul. 113(7):737-9. [Medline]. Holt GR, Garner ET, McLarey D. Postoperative sequelae and complications of rhinoplasty. Otolaryngol Clin North Am. 1987 Nov. 20(4):853-76. [Medline]. Kamer FM, Churukian MM, Hansen L. The nasal bossa: a complication of rhinoplasty. Laryngoscope. 1986 Mar. 96(3):303-7. [Medline]. Klabunde EH, Falces E. Incidence of complications in cosmetic rhinoplasties. Plast Reconstr Surg. 1964 Aug. 34:192-6. [Medline]. McCollough EG. Surgery of the nasal tip. Otolaryngol Clin North Am. 1987 Nov. 20(4):769-84. [Medline]. Rees TD. Postoperative considerations and complications. Aesthetic Plastic Surgery. Rees TD, ed. Philadelphia, Pa: WB Saunders Co; 1980. 337-386. Steiss CF. Errors in rhinoplasty and their prevention. Plast Reconstr Surg Transplant Bull. 1961 Sep. 28:276-8. [Medline]. Thomas JR, Tardy ME. Complications of rhinoplasty. Johns ME, ed. Complications of Head and Neck Surgery. Philadelphia, Pa: BC Decker; 1986. 269-270. Wise JB, Becker SS, Sparano A, et al. Intermediate crural overlay in rhinoplasty: a deprojection technique that shortens the medial leg of the tripod without lengthening the nose. Arch Facial Plast Surg. 2006 Jul-Aug. 8(4):240-4. [Medline]. An open excision of a nasal boss. Disclosure: Received ownership interest from Mind:Set Technologies for other.